Rosemary Knits: NEW Spindle! NEW Mitts! NEW Earband! Hooray! I'll fight anyone who tries to take it away from me. Yes, Emma, I know - awful joke. By the way, yes, it's true, Emma's hair, fingernails and bathrobe are all the same color. Which makes me want to sing, too, Emma darling. I think that Emma gets extra points for being perfectly willing to stand out in the yard on a frigid morning, posing for pictures, wouldn't you agree? The fact that she was perfectly willing to do completely silly things means that she'll get to have ice cream for breakfast whenever she wants. Thanks, Emma! Anyway, back to the project. So, I was thrilled with my Christmas present, and I got to spinning right away, later that Christmas day. 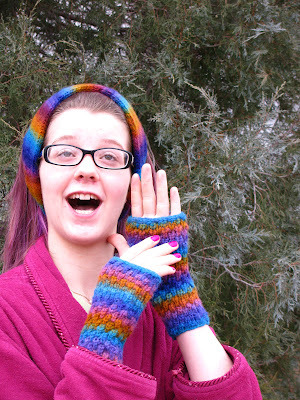 I had in mind a pair of fingerless mitts and an ear band, right from the very start. Susan sent me a nice 4oz bunch of fiber. I split it cross-ways in half, and then I split one of the halves the long way, and I spun each of the three pieces in my favorite way - Tammy Rizzo's Navajo Ply on the Fly method. I'm working on spinning softer, less tightly spun yarn this year, and I was off to a good start with this batch, and then I slowly reverted to my old ways, slowly getting tighter and tighter. Old habits are so hard to break! My good friend, Joyce, came over on New Year's Eve, and like the wild women that we are, we sat and knitted. I don't think that we even had much to say to each other - we just knitted, and as I recall, Joyce went home by around 10:30 - woot! What a raucous New Year's celebration!!! She worked on a hat for her daughter, and I played around with some scrap yarn - I had been out shopping with my daughters the week before, and I saw a sweater in a shop with a very interesting stitch pattern, and I wanted to copy this pattern for my mitts. I messed around and messed around, and I never did figure out that stitch pattern. Instead, I discovered this one, and I like it so much better than the one I was trying to duplicate. I love it when this happens. Does this stitch pattern have a proper name? Surely, someone has knitted it before? It goes like this. 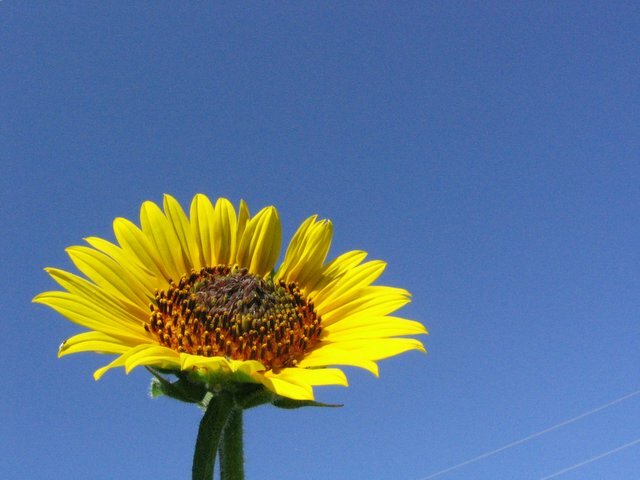 Cast on - join in a circle. Knit three rounds. On the fourth round, k1, then stick the point of the right needle into the stitch which is three rounds down and knit the stitch then pull the knitting so that the stitches above it unravel, then k1 and repeat all the way around. Repeat these 4 rows ad infinitim, alternating the rows in which you dip down. That's it. It's really easy, and I love it! It makes a THICK fabric which is highly textured. I got such a kick out of the fact that the stitch pattern and the striping of the yarn are almost an exact match - each 4 row repeat is in a different color. Well, almost each repeat. Anyway, it was fun watching this happen! Notice - both mitts start and end in aqua blue. I was so excited that I nearly cried. Nerdy? It's something like brioche in that what you end up with is so much wider than what you started out with, so careful swatching, and an exceedingly loose cast on is in order. Also, the stitch pattern doesn't show up very well, and the ultimate width of the stitch pattern isn't readily apparent, until 3 or 4 rounds of the pattern has been worked, so swatch for quite a few inches before you make your decisions. Like I said, I divided the fiber into three parts - the larger part was spun to make the ear band, and the two smaller parts were for the mitts. I spun one of the smaller parts from one end, and the other of the smaller parts from the other end. so that the striping on each ball of yarn was opposite from the other. I knitted both mitts from the cuff to the fingers and I started knitting from the beginning of the spinning. So, as you can see, the mitts have opposite striping patterns - one of them goes, from the cuff up, blue, gold, pink, purple, and the other one is the opposite. Yes, I am, indeed, this nerdy. They are knitted in the simplest way possible - just a plain tube for a while, then I switched to knitting back and forth for a vertical-slit thumb hole, then back to knitting in the round. I used my favorite mitt cast off - the applied i-cord bind off. It's so durable and non-stretchy so that the finger end of the mitts keeps its shape really nicely. 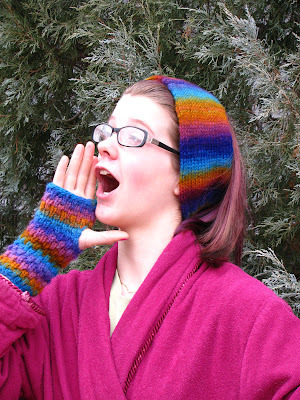 I knitted the ear band with my old standby ear band pattern. Swatch to determine how wide you want it. Provisionally cast on this many stitches, then knit a stockinette tube for about 3 inches. Then, switch to a k2p2 rib-tube for about 2.5 inches, then go back to knitting stockinette. When it gets long enough, kitchener the tube closed and you're done! This makes a nice, thick layer of smooth knit stitches across your ears and a cinched up length of k2p2, which goes under your hair. I love this pattern - it's also nice to have miles of stockinette for those public knitting sessions, such as knitting at the coffee shop - this keeps my hands busy, but I don't have to think about what I'm doing. It came out much nicer than I thought that it would. Here's what I did, to the best of my recollection. When you knit a k2p2 tube, and you fold the tube flat, you can arrange it so that the purls of the front layer nestle into the knits on the other side, or the back layer. So, I just knitted or purled these together, one stitch from the front needle and one stitch from the back needle, which reduced my tube to a single, flat layer which required only half the yarn to go one round. I knitted back and forth for about 1.75 inches, and then I wanted to return to a k2p2 tube. If I recall correctly, this is what I did. I inserted the tip of the needle in between the legs of the stitch below the next-stitch-to-be-worked, and pulled a loop through, then slipped the stitch which should have been worked. Now, I have two knit stitches on my right hand needle - one just added, and one from the previous row, but both are pulled through the same stitch on the row below. I continued across, adding either knits or purls as the situation warranted. When I got to the end of the row, I turned. On this row, I knitted or purled the stitches which had been slipped on the previous row, and slipped the stitches which had been added. When I got to the end of the row, I turned. I got out another needle, a dpn of the same diameter, this time working the previously slipped stitches, and slipping the previously worked stitches onto a dpn. Turn. Now, resume knitting a tube. It sounds like more trouble than it really was, and it saved probably about 10 yards (or more?) of yarn. It looks really nice, too. In fact, it looks exactly like all of my other ear bands. Funny how that worked out. Maybe I'll do all of them this way? I really like earbands and mitts. Here in Southern Colorado, our winters are exceedingly mild, and often, it's just not cold enough for a hat. However, I wear my long hair pulled back into a bun, exposing my delicate ears, and an ear band is perfect. 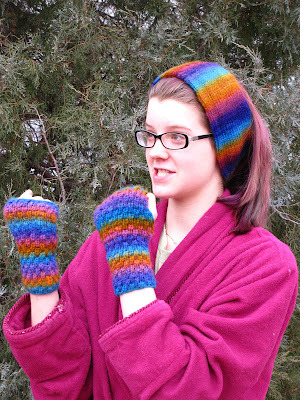 Same goes for my hands - my hands often get all sweaty in mittens, but are just right in fingerless mitts. Folks who've never worn them often don't understand how they help at all, since it is your fingers which get cold, not your palms. All I can say is - try them and see for yourself. They work very well, and your fingers are free. As an aside, my daughters' ballet mistress requested a pair of mitts a few years ago. See, she and her husband studied for their pilot's licenses for their 70th birthdays! WOOT! She thought that mitts like this would be so perfect for flying, as there is lots of wind in the cockpit, but she can't wear gloves because of needing to operate the dials and so forth. Just a couple of weeks ago, they bought a plane of their very own. It's from the 40's, and it's bright yellow. Hey! I just thought of something! I should make new mitts for her, and a pair for her hubby to match their little yellow bird! Good idea! A little tip - next time you need to replace a lamp shade - pick out this shape. Loosen the thumbscrew at the top, and you've got yourself a really nice swift! Another aside, have you ever seen such cute wrapping paper? This is what held my spindle and fiber secret until Christmas Day. Yes, I took photos of the wrapping paper, and yes, like I said before, I am that nerdy. What amuses me is this - my children were so enchanted that I got presents from someone that they never met that they insisted that these be the first presents that I opened. I don't know why this charmed me so, but it did. All three of them watched and waited while I opened these presents, and they oohed and aahed right along with me. It made me so happy! Thanks soooooo much, Susan. 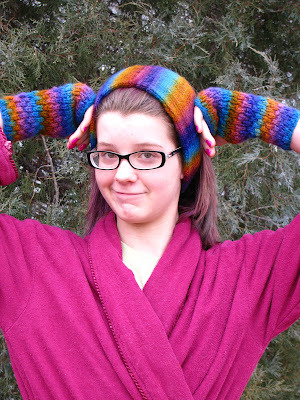 While Emma is the model, these mitts and earbands are keeping ME nice and warm on my daily walks. The fiber made such nice yarn - more boingy than I've experienced thus far. It was a delight to knit. I absolutely adore the colors, and like I said, it spun up to be almost the exact amount needed for this project. I'm using the remaining 5 or so yards for skein ties for my sweater project. And the spindle - the spindle is a complete work of art. THANKS A MILLION TIMES THANKS! Love the knitting. Emma is a gorgeous and entertaining model!! 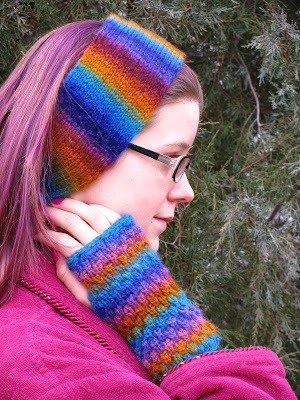 Love love love the mitts and earband. Just gorgeous. And the spindle is lovely too! that stitch is AWSOME--and your kid is a HOOT!!! LOL! Yes, Kindred, my kid IS a hoot. I have the world's strongest laughing muscles, this I can assure you - it's pretty much all I do all day long!